A worrying 70 per cent of employees say their stress levels have increased with more than half feeling the strain on a daily basis. Despite increased efforts to improve mental wellness, it seems Canada is still suffering from a stress epidemic after one new study revealed more than half of employees feel the strain on a daily basis. Conducted by staffing firm Accountemps, the survey found that 58 per cent of Canadians feel stressed at every day while at work and 70 per cent said work-related pressure had increased in the past five years. "As companies move quickly to keep pace with evolving business needs, employees are often left feeling overwhelmed by mounting workloads and looming deadlines," said Dianne Hunnam-Jones, Canadian president of Accountemps. "Organizations must ensure workers feel supported by providing adequate tools and resources to help prioritize projects, without compromising work-life balance." They survey also revealed that executives are somewhat out of tune with how their staff are really feeling with just 21 per cent of CFOs saying their teams are stressed and only 23 per cent acknowledging an increase in worker anxiety. "Executives should be conscious of the signs of burnout, like increased overtime or missed deadlines, which can lead to waning morale, lower productivity and high turnover," said Hunnam-Jones. "Have regular check-ins with staff to review deadlines, pinpoint stressors, and come up with ways to mitigate pressure while ensuring business goals are still met." Employees surveyed pointed to heavy workloads and looming deadlines as the biggest worry (41 per cent), followed by attaining work-life balance (22 per cent), and unrealistic expectations of managers (17 per cent). Younger workers seem most susceptible with 60 per cent of professionals between the ages of 18 and 34 admitting to being stressed at work, compared to j55 per cent of respondents aged 55 and over. 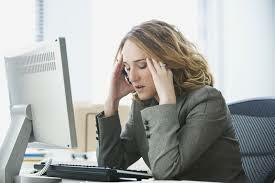 Women also reported being slightly more stressed than men at 58 per cent and 57 per cent respectively.